Chemex coffee maker - one of the best brewing methods I've yet to try. It takes out all the bitterness of a coffee for a pure taste. My mom got it as a birthday gift for me and I love it. Summer time with Dave - It's our first summer being married - we've had lots of fun and I'm grateful. Phase 10 by candlelight - with all the storms Dave and I lost power several times. Chevron Clutch - My Mom and I went shopping at a cute boutique in Wichita called the Cottage Collective. They have the cutest homemade crafts. Diamond Scratch Off Cards - I'm looking forward to help host my work spouse's bachelorette party! It will be fun. 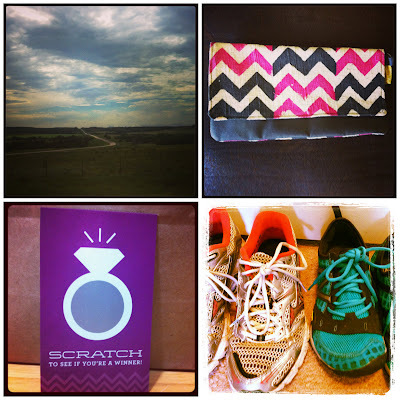 Running and Crossfit - This is my first week of half marathon training. It's also my first week to combine running and crossfit. It's been good but hard. Honestly, my body isn't used to doing all this activity. After throwing a tantrum during my first training run, Dave had the privilege of pointing out how I need a better and positive attitude. I needed to hear that from him! I'm thankful that marriage is a place where our spouse can lovingly point out areas we need to work on. It isn't always fun to hear but it's needed. Those are some small tidbits on my life lately. What have you been up to? Hello! 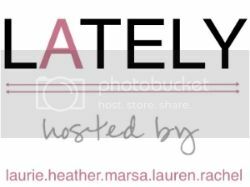 I found you through the Lately with Heather! I have never heard of a Chemex coffee maker before, it sounds amazing though! Good luck with your half marathon training!